Though primarily known as a statesman, Winston Churchill was also a very capable futurist and inventor. From the rise of Nazi Germany and the Iron Curtain to the advent of tanks, the atom bomb and synthetic biology, here are some of Churchill's most incredible predictions and inventions. In addition to being a politician and army officer, Churchill was a historian, a writer, and an artist. And in fact, he's the only British Prime Minister to have ever won the Nobel Prize in Literature. But he was also keenly aware of the impact that technological progress was having on nations and individuals. He witnessed the rapid evolution of technology during the Great War and saw how it could change the very course of history. What's more, he understood something that futurist Ray Kurzweil would later call the Law of Accelerating Returns — the realization that technological developments are cumulative, a force that leads to rapid progress. Each invention acted and reacted on other inventions, and with ever-growing rapidity that vast structure of technical achievement was raised which separates the civilization of today from all that the past has known. There is no doubt that this evolution will continue at an increasing rate. We know enough to be sure that the scientific achievements of the next fifty years will be far greater, more rapid and more surprising, than those we have already experienced...But this is only a beginning. High authorities tell us that new sources of power, vastly more important than any we yet know, will surely be discovered. With this in mind, Churchill went on to predict such things as compact engines, materials 30 times stronger than steel, and wireless telephones and televisions that would "enable their owner to connect up with any room similarly installed, and hear and take part in the conversation as well as if he put his head in through the window." He predicted synthetic biology, claiming that "new strains of microbes will be developed and made to do a great deal of our chemistry for us." Remarkably, Churchill also foresaw lab grown meat. He said that "we shall escape the absurdity of growing a whole chicken in order to eat the breast or wing by growing these parts separately under a suitable medium." This particular prediction was equal parts wish-fulfilment, a desire for on-demand food that arose from his experience during the Great War when Germany tried to starve the British Isles into submission. But equally startling developments lie already just beyond our finger-tips in the breeding of human beings and the shaping of human nature. It used to be said, 'Though you have taught the dog more tricks, you cannot alter the breed of the dog.' But that is no longer true. A few years ago London was surprised by a play called Rossum's Universal Robots. The production of such beings may well be possible within fifty years. They will not be made, but grown under glass. There seems little doubt that it will be possible to carry out in artificial surroundings the entire cycle which now leads to the birth of a child. Interference with the mental development of such beings, expert suggestion and treatment in the earlier years, would produce beings specialized to thought or toil. The production of creatures, for instance, which have admirable physical development, with their mental endowment stunted in particular directions, is almost within the range of human power. A being might be produced capable of tending a machine but without other ambitions. Our minds recoil from such fearful eventualities, and the laws of a Christian civilization will prevent them. But might not lop-sided creatures of this type fit in well with the Communist doctrines of Russia? Might not the Union of Soviet Republics armed with all the power of science find it in harmony with all their aims to produce a race adapted to mechanical tasks and with no other ideas but to obey the Communist State? The present nature of man is tough and resilient. It casts up its sparks of genius in the darkest and most unexpected places. But Robots could be made to fit the grisly theories of Communism. There is nothing in the philosophy of Communists to prevent their creation. Churchill had clearly been reading up on H. G. Wells and J. B. S. Haldane. And pre-dating the advent of the atom bomb by nearly 15 years, he warned that "Explosive forces, energy, materials, machinery will be available upon a scale which can annihilate whole nations." In the letters, Churchill describes the dangerous political situation created by the hostilities between the Turks (the Ottoman empire) and an alliance of Balkan states. The European powers, already at odds with each other, were ranging themselves on either side, with Britain opposed to the Turks and Germany sympathetic to them. "The European situation is far from safe and anything might happen," Churchill wrote. "It only needs a little ill will or bad faith on the part of a great power to precipitate a far greater conflict." Two years later, the Austrian Archduke Franz Ferdinand was assassinated in the Balkans, providing the spark for war in Europe that Churchill predicted. If there's anyone in history who deserves to say, "I told you so," it's Winston Churchill. As early as 1930, he became aware and wary of Adolf Hitler and the Nazis. Speaking to Prince Bismarck at the German Embassy, he acknowledged Hitler's claim of not wanting to wage a war of aggression. But as the Prince later noted, Churchill "was convinced that Hitler or his followers would seize the first available opportunity to resort to armed force." Germany is arming fast, and no one is going to stop her. I dread the day when the means of threatening the heart of the British Empire should pass into the hands of the present rulers of Germany...I dread that day, but it is not, perhaps, far distant. A year later he forecasted the London Blitz. He asked for an air defence system in the capital saying that in the next war, "attempts will be made to burn down London." Then, after the Nazis militarized the Rhineland in 1936, Churchill warned in a newspaper column that the Reich "is arming more strenuously, more scientifically and upon a larger scale, than any nation has ever armed before." Critics derided him as Britain's "number one warmonger." In 1939 Hitler invaded Poland and the Second World War began. Revealingly, Churchill hated the label, "World War II," instead preferring to call it the "Unnecessary War." Even while the battles were still raging in the Second World War, Churchill was already thinking several steps ahead to when the conflict was over. Assured of Allied victory, and unwilling to punish Germany by "deindustrializing" it into a pastoral, agricultural nation, he instead called for a "United States of Europe" modeled after America. 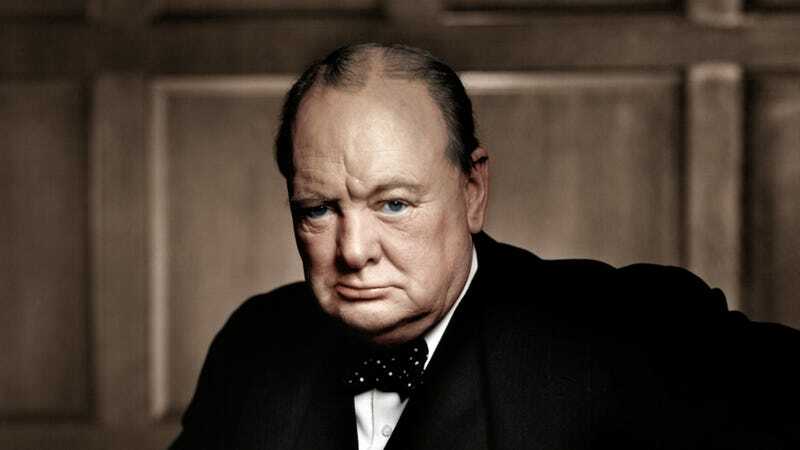 The establishment of the Soviet Union's Eastern Bloc prevented Churchill's plan from materializing, but the subsequent rise of the European Union would have made Churchill proud — though he, like many Britons today — would have wanted the UK to stay out of it. In 1946, while addressing an audience in Fulton Missouri, Churchill predicted the future of post-War Europe under the "iron curtain" of Soviet rule. I have a strong admiration and regard for the valiant Russian people and for my wartime comrade, Marshal Stalin. There is deep sympathy and goodwill in Britain – and I doubt not here also – toward the peoples of all the Russias and a resolve to persevere through many differences and rebuffs in establishing lasting friendships. It is my duty, however, to place before you certain facts about the present position in Europe. From Stettin in the Baltic to Trieste in the Adriatic an iron curtain has descended across the Continent. Behind that line lie all the capitals of the ancient states of Central and Eastern Europe. Warsaw, Berlin, Prague, Vienna, Budapest, Belgrade, Bucharest and Sofia; all these famous cities and the populations around them lie in what I must call the Soviet sphere, and all are subject, in one form or another, not only to Soviet influence but to a very high and in some cases increasing measure of control from Moscow. The safety of the world, ladies and gentlemen, requires a unity in Europe, from which no nation should be permanently outcast. It is from the quarrels of the strong parent races in Europe that the world wars we have witnessed, or which occurred in former times, have sprung. Twice the United States has had to send several millions of its young men across the Atlantic to fight the wars. But now we all can find any nation, wherever it may dwell, between dusk and dawn. Surely we should work with conscious purpose for a grand pacification of Europe within the structure of the United Nations and in accordance with our Charter. Prior to the outbreak of the First World War, Churchill made a historic decision to shift the power source of the British navy's ships from coal to oil. His intention was to make the fleet faster than Germany's. But the implications were not lost on the First Lord of the Admiralty; he recognized that the Royal Navy could no longer rely on coal from Wales — but on insecure oil supplies from what was Persia at the time. It was at that moment that energy security became a question of national strategy. As Churchill said, "Safety and certainty in oil lie in variety and variety alone." In 1905, he foresaw the creation of the Israeli State. Churchill was the first non-Jewish Zionist. Twelve years before the Balfour Declaration, in 1917, Churchill called for a Jewish State. It was not as if he represented New York's Lower East Side or Miami populated by Jews. Then in 1921, in a speech to the House of Commons, he spoke of a militant Islam sect, the Wahabis, more violent than any in history, which would kill their own sisters for wearing the wrong attire. These fierce zealots would terrorize the West with bomb-carrying Jihadists who would burn embassies and destroy buildings by their passion to sacrifice their lives for guarantee of Islam heaven. Winston Churchill II would read his grandfather's speech to President George W. Bush in the White House in 2007. If Churchill didn't exactly predict 9/11, he described its radical extremist perpetrators. Churchill, in addition to his intellect, uncanny memory, and vast reservoirs of knowledge, also had an overactive imagination — one that allowed him to conjure-up a number of inventions. The Great War gave birth to the tank, an innovation that most assuredly would not have appeared so early in history had it not been for the statemate on the Western Front. As early as 1914, impressed by the effectiveness of armed and armored cars in the early weeks of fighting...Churchill was asking the naval designers at the Admiralty to see if they could turn such vehicles into some kind of "trench-spanning" machine. Such a machine proved impracticable, there being no way to drive wheeled vehicles across trenches, but by January 1915 Churchill had found a different approach. Convinced that human flesh and bone were never going to be a match for artillery and machine guns, and encouraged by military engineers, Churchill sent a memorandum to Prime Minister Asquith proposing the development of "steam tractors with small armored shelters, in which men and machine guns could be placed, which would be bullet-proof" and would "enable trenched to be crossed quite easily." Also called Mulberry Harbours, these D-Day fixtures were conceived by Churchill as far back as 1917. The need for portable temporary harbours emerged during the Great War in anticipation of marine landings. In the event that an enemy port could not be captured, Churchill envisioned the sinking of old ships to create a bridgehead. Yes, you can blame Winston Churchill on the onesie, or what he called the "siren-suit." He conceived of the one-piece garment as a leisure suit, but it also proved useful for use on the way to and in air-raid shelters. It solved problems of warmth and propriety when seeking shelter during nighttime air raids. It was deliberately roomy so that it could fit easily over clothing. Okay, this one never really materialized, but I thought I'd mention it anyway because it's so cool. Inspired by the invention of pykrete — a frozen slurry of wood pulp and ice — Churchill approved a project to determine if giant aircraft carriers could be made from ice. Called Operation Habakkuk, it was an effort to fend off German U-boat attacks. "I attach the greatest importance to the prompt examination of these ideas," he wrote in his approval letter. "The advantages of a floating island or islands, even if only used as refueling depots for aircraft, are so dazzling that they do not need at the moment to be discussed." A scale model was eventually built in 1944, but by then the situation in the Atlantic was drastically different. The operation was eventually cancelled.